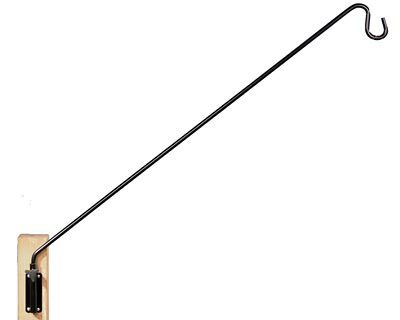 Hang your bird feeders or flower baskets in style with the Green Esteem Extended Reach Wall Bracket. Equipped with a wall-mounted bracket, this 37" long arm and sturdy base are ideal for all bird feeders, hanging plants, lanterns, and other decorative items. The sleek and classic design coupled with the ability to position these treasures in the perfect viewing spot make the Extended Reach Wall Bracket a treat for every home. Simply slide the arm into the wall-mounted bracket and using the easy to grasp, adjustable knob, turn until tightened and secure. Loosen the adjustable knob to swing the arm in a full circular motion for refilling feeders or watering plants. The durable weather-resistant finish will maintain its black color and quality season after season. The bracket is easy to install using mounting screws.